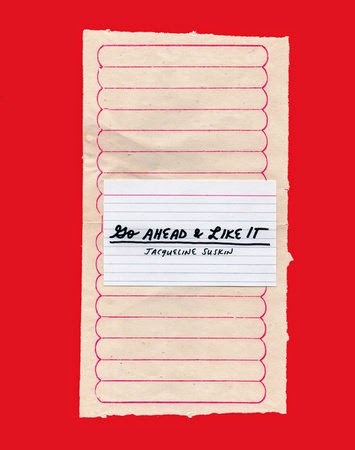 I know there are more, and I hope to take the advice of Jacqueline Suskin in her newest book, Go Ahead & Like It, by writing down and keeping a record of the things I like, the things that make me happy, the things that encourage me, and the things that help improve my attitude when I'm having a bad day. PROS: This book is definitely not boring and I've never seen any other book like it. It is full of pictures, has a unique design, and uses fonts that mimic handwriting or an old-fashioned typewriter. There are lists of "likes" from anonymous people, and ideas to help us brainstorm into making our own lists. It is "an inspiring prompt for daily appreciation," which basically means the book helps teach us how to count our blessings. I am always appreciative of books that help me do that. CONS: Unfortunately, there is at least one annoying and completely unnecessary word in the book that I do NOT like. It is a word that rhymes with truck. To be fair, the author did not write it. It was included in one of the lists by an anonymous person. Overall, this is a nice, easy-to-read gift book that can help its readers notice and celebrate the "little" things in life that bring us so much joy but, because of that one word, I most likely would not give a copy of this book as a gift (unless I blacked out that word and explained why there is smudge on one of the pages). NOTE: I received this book from Blogging for Books for the purpose of this review.